We’ve all been in scenarios where we needed a cooler to keep some items cold for a period of time. This could have been for something as simple as packing a bag for lunch or bringing some items home from the grocery or it could have been something more elaborate such as planning for a week-long excursion out in the wilderness. Is it worth pursuing Yeti coolers on sale or going with a much more affordable ice chest? The common theme in these and many other examples is the necessity to use a cooler or ice chest. A cooler can take on a variety of shapes and sizes and have many other characteristics that make it stand out from other coolers. The one common theme between all of them is their attempt to keep our items cool until they can be consumed. There are literally thousands of different coolers on the market (many of which we have tested! ), each with their own unique pros and cons. When researching for the best product for your needs, it is easy to get overwhelmed at what all is available. How much storage space do you need? How long does it take before it needs new ice? How mobile is it? How durable is it? Is it within my budget? These and many other questions will likely go through your head. Different brands will have different strengths and weaknesses. 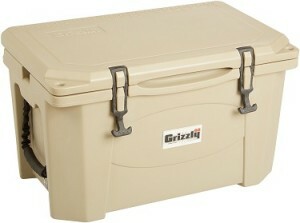 Grizzly coolers on sale will vary some from Yeti coolers on sale. Engel coolers on sale will vary from Pelican coolers on sale. It can be quite overwhelming! To assist in this matter, we have created this site that is dedicated to breaking down and analyzing all of the major coolers, from the simple soft-sided lunch bags all the way to the gargantuan premium ice chests. We have created a simple ranking system that should help steer you in the right direction based off of your individual needs. We are proud to say that we are the most expansive site on the internet that is dedicated to strictly cooler reviews, and we take it very seriously. We are brutally honest with our reviews and are not swayed by manufactures to make biased ratings. We want you to find the best product to meets your needs! If you have any additional questions or wish for us to review a specific product not already listed feel free to contact us at any time! In reviewing and rating the many coolers on this site, we felt that there are several factors that just about everyone considers when researching coolers. These factors, when analyzed on an individual basis, just give us a glimpse but when combined it results in a pretty encompassing review that can quickly and easily give an overall idea of how good or bad a cooler is. This aggregate score is custom and unique to TheCoolerZone.com, and we are proud of that. Cooling ability is a pretty straightforward metric: how well does the ice box cool? OK, maybe it isn’t that straightforward. It would be unfair to simply rate based on how long it keeps items cool, or else all of the huge premium coolers would rank well while the smaller, personal-sized soft-sided coolers would fail miserably. Rather, the rating a product receives is based off of its cooling performance when compared to comparable products on the market (in terms of size, cost, target audience, etc.). The goal here is to be able to tell someone what their best cooling options are no matter what their target product category is. Mobility and durability have been combined here. The reasoning behind this is simple: both factors play an important role, and oftentimes both can somewhat offset each other. In other words, a tough, thick cooler using premium parts tends to be heavier and less mobile, while a small and lightweight cooler using cheap and thin material will oftentimes fall apart relatively easy. To find a happy medium, we have combined the two. Products that are both tough and mobile will rank well, while items that excel in one but struggle will have their rating bumped down some. Visual appeal is somewhat subjective and for many won’t play a huge role in a cooler purchase and because of this it doesn’t play a huge role in the overall rating. However, it still has its part and was worth creating a category for. Basically visual appeal tries to capture how aesthetically pleasing the cooler is. How many color choices does it come in? Does it manage to incorporate external features without looking cheesy or gaudy? Do the various components come together to result in something that looks to be of high quality? These are some of the questions we considered for this rating. Cost is probably the most filtered and researched metric that people look into, and for good reason. There is a huge range of prices associated with ice chests. They can be anywhere from under 10 dollars to reaching 4 figures! To simplify matters, we have broken down the cost into “quarts per dollar”. In other words, we divided the typical online price by the number of quarts of storage each product has. This gives us a more consistent comparison across various sizes, since it wouldn’t be fair to directly compare the overall cost of a 140 quart cooler to a 6 quart tote since obviously the larger size will be more expensive. Due to constant fluctuations in prices online, we have broken down the prices into “budget, intermediate, and premium”. Budget will be the most affordable products available, intermediate will be the middle-of-the-road items, and the premiums examples will be what fetches the big money. The overall rating is the most important metric, and it encompasses all of the considerations made in the other metrics. It gives us a “big picture” of how we view that particular product, and makes it easier to do a direct comparison between two ice boxes that might otherwise be too different to make a direct comparison to. Anything that has an aggregate score of 3 or above essentially means that we would recommend those products, and items that happen to receive a 4 or above are sure-fire picks that we feel pretty confident you’ll be happy with. We have created special pages that display all coolers we have reviewed from a particular manufacturer. Do you know in your mind that you want a Yeti? Are you wanting to read more specifically on Igloos? We make that process simple and straightforward. Click here to read more on this process and find helpful links to all manufacturers. There is a wide range of cooler sizes available, from tiny lunchboxes all the way up to coolers large enough to fit an entire beach party worth of supplies. Someone who is looking for a small picnic tote doesn’t want to have to look at enormous marine ice chests, and someone that needs a cooler to store all supplies for a week-long mountain excursion doesn’t want to filter through a bunch of backpacks. To streamline this effort, we have broken down the coolers into 5 sizes based on storage volume. Click on any of the sizes below and you’ll be sent directly to the full analysis of listing of them. Just about every purchase that someone makes involves considering the price before hitting “buy”. Because of this, it was important to create tiers based on this. Rather than simply listing coolers from cheapest to most expensive, we broke things down into a “dollar per quart” ratio. This helps to make comparing a tiny cooler backpack to a huge plastic fishing cooler much easier. The three brackets are: budget, intermediate, and premium. You can click on any of the links below to be taken directly to the entire listing for that price tier.